Portugal´s rally-legend and former FIA World Champion Carlos Sousa is back! 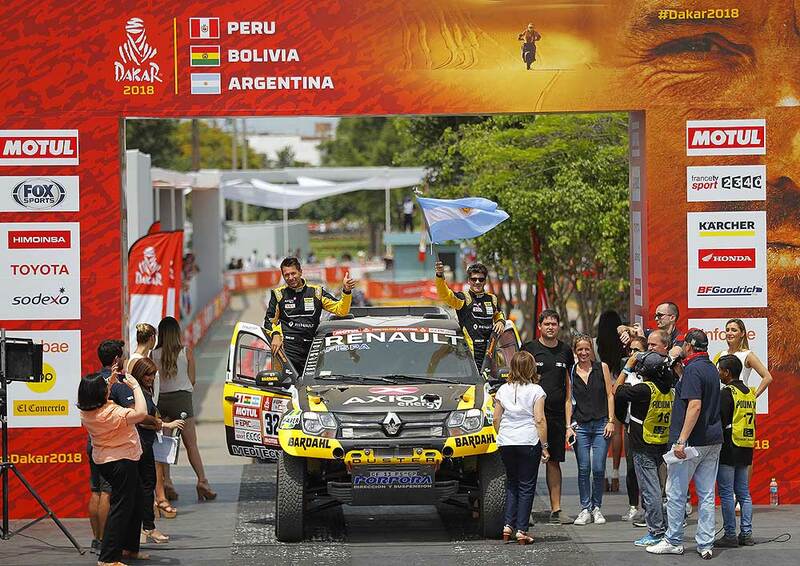 Together with his navigator Pascal Maimon they are piloting a factory Renault (Dacia) Duster of Renault Argentina. In the opening challenge, Sousa and Maimon finished in 30th place, due to some inconveniences with navigation. But the first day behind the steering-wheel of the V8-powered prototype, which really really has nothing to do with the original Duster had bad luck: They missed a checkpoint and got two hours penalty, that pulled them down to 85th place. "We lost at least two minutes in search of a waypoint and we failed in another, this race is like that, and from now on we can only improve," Carlos Sousa reported after the stage. "If we did not have that problem we could have been in the Top 20." The second factory-Duster is piloted by the Argentinians Emiliano Spataro and Santiago Hansen, , theyachieved the 35th position in the first stage. "It was an entertaining, short and demanding stage in the dunes," said Spataro. "Navigation is key, we could not find a waypoint quickly and we had to go back to look for it, we passed by but we could not locate it. We returned and finally we found it to be able to continue. The Duster went very well, I liked how it worked. We had good pace, but that inconvenience added time. For being the first stage I am satisfied. Two or three minutes more may influence today's position, but we have just traveled 30 kilometers, this is just beginning."